20 Ways to Wear Your Printed Shirts Right. We know, wearing printed shirts was considered a cardinal sin the fashion world. But that’s not the case anymore. Thanks to celebrities sporting this trend more frequently, printed shirt look is in. The look is considered more of a fashion statement than a sin. 1. Love this Fish Printed Shirt and one can style it on Black Chinos and a pair of White Sneakers. 2. All over Red Printed Shirt styled with Blue Denim Jeans and a pair of Light Brown shoes. 3. Something Different Something Flamingo’s. 4. White Printed Shirt + Brown Chinos + Beard = Totally killing it. 5. Dark Blue Printed shirt styled with Grey Dress Pants and one can finish this outfit by wearing Blue Espadrilles. 6. Cloud Print Shirt styled with White Dress Pants and one can complete this outfit by wearing Brown Oxford Shoes. 7. Floral Printed Shirt styled with Denim Jacket which is looking stunning. 8. Isn’t this Printed Shirt amazing ? 9. Superb formal look with this Grey Polka Dot Shirt, Printed Tie and Trousers. 10. Street style with this Banana Printed Shirt. 11. Something interesting and fancy for the dinosaur lovers. 12. 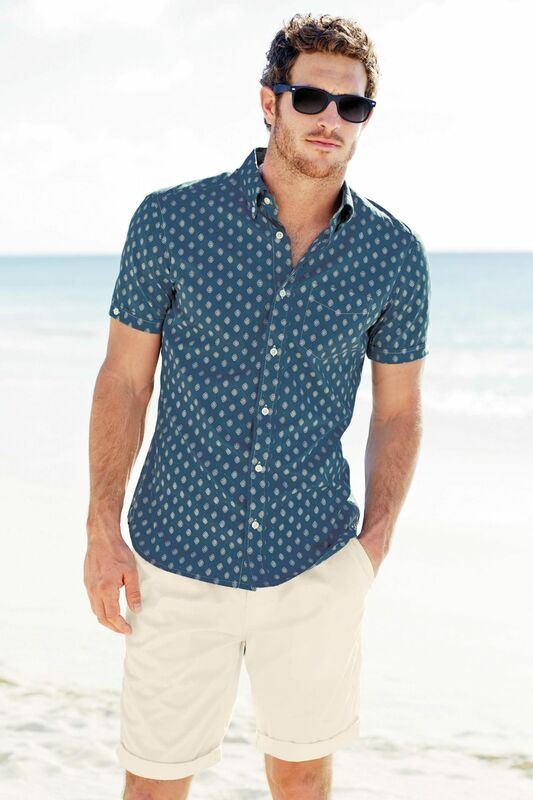 Perfect summer beach look in Blue Printed Shirt styled with Cream Shorts. 13. Off-Business look in Black Printed Shirt styled with Yellow Shorts. 14. Printed Shirt styled with Plain White T-shirt, pair of Black Jeans and one can finish the outfit by wearing Black Sneakers. 15. Cheetah Print Shirt style with Black Ripped Jeans and a pair of Black shoes. 16. Casual day outfit – Printed shirt with white shorts and paired with white sneakers. 17. Colourful leafs printed shirt – a perfect vacation shirt. 18. Printed shirt and white jeans styled with white sneakers. 19. Green printed shirt with white pants and brown belt. 20. Semi-formal outfit – White shirt with black print on black pants.